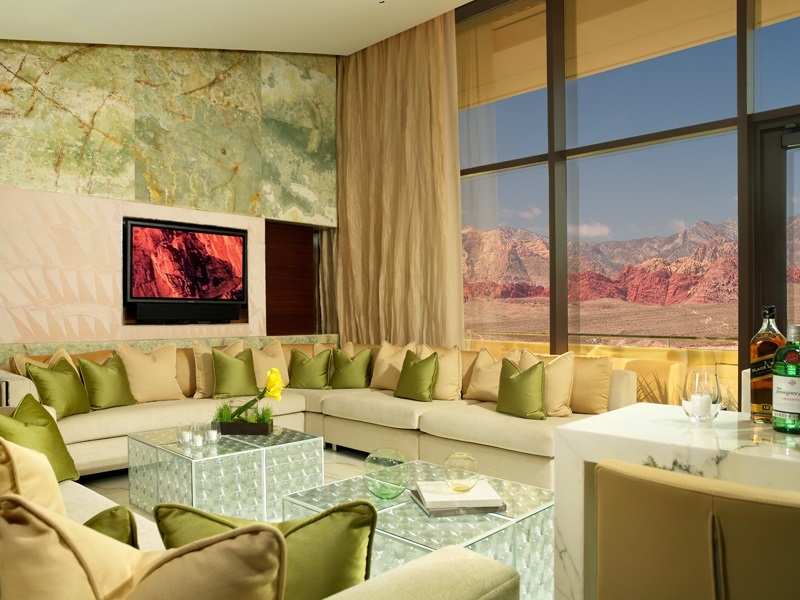 Imagine being 20 stories in the air with unparalleled views of the striking Red Rock Canyon mountains, enjoying 3,800 square feet of beautiful, modern luxury from your very own massage room. 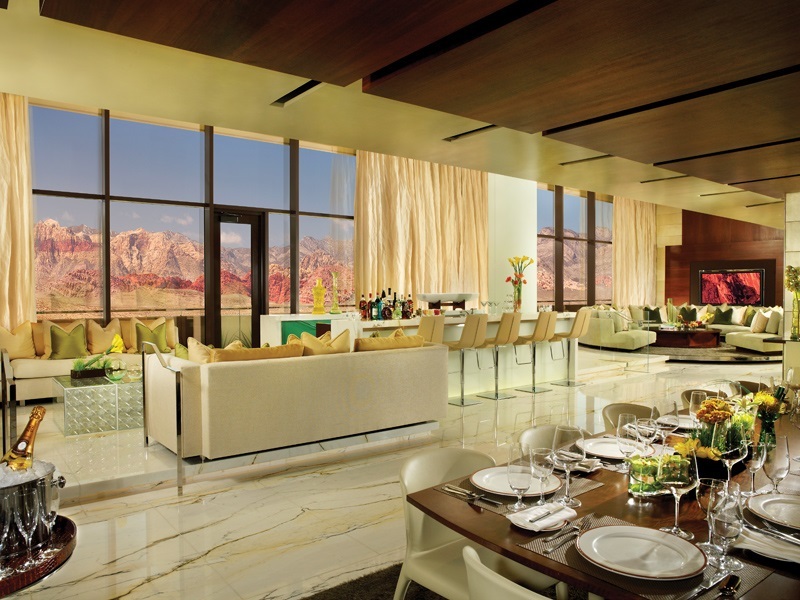 All of this and so much more is available to you in our stunning Canyons suite. 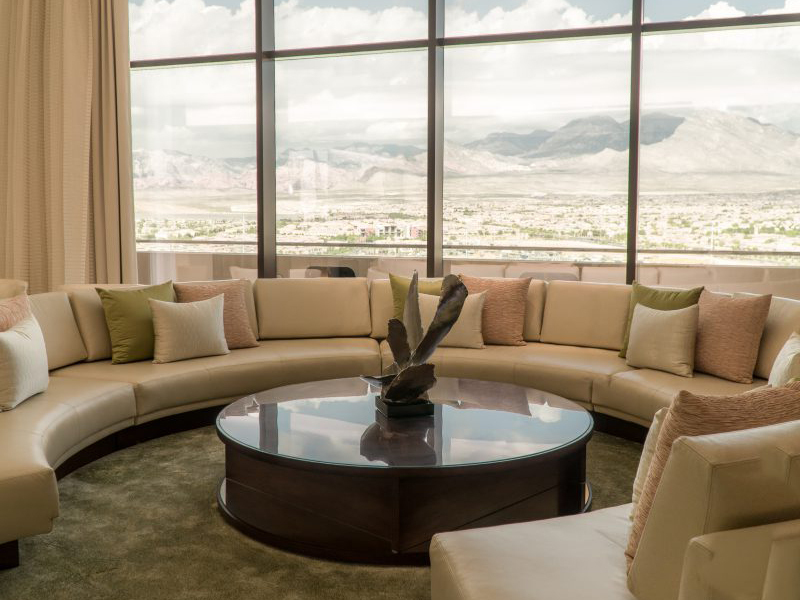 Featuring two master bedrooms, a private bar for five, a sweeping patio with amazing Las Vegas views, and unparalleled butler service, the Canyons suite is a the travel experience you absolutely should enjoy. 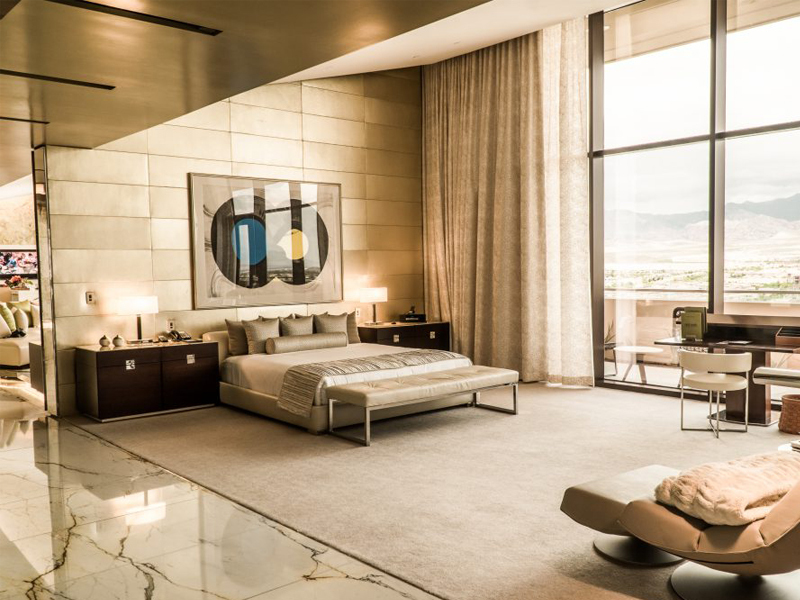 We'll give you one guess how this ultra-luxurious Las Vegas luxury suites got its name. 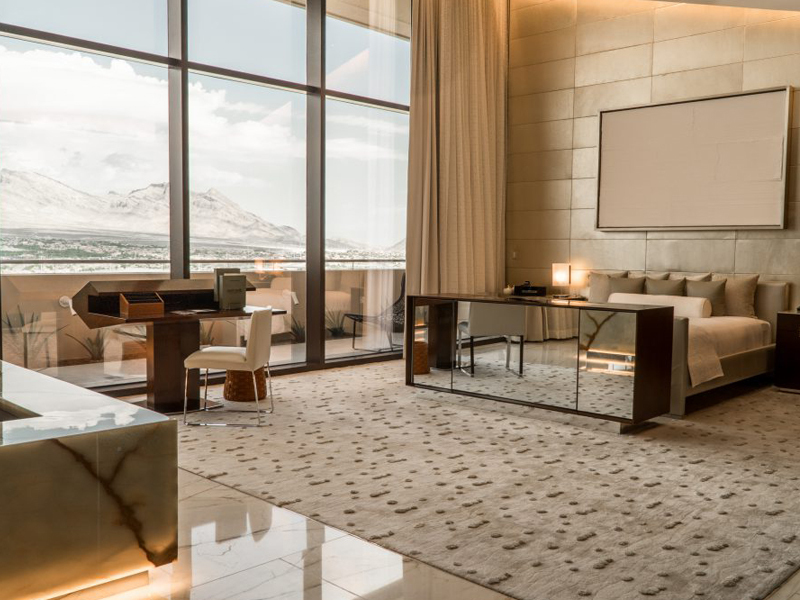 At 3,800 square feet with two master bedrooms, the Canyon Suite features one of the most amazing views of any luxury hotels in Vegas — Red Rock Canyon with its stunning vistas and endless blue skies. And, the private patio looks down on our magnificent, three-acre backyard pool which will tempt you to take a dip or just lounge around and work on your tan. 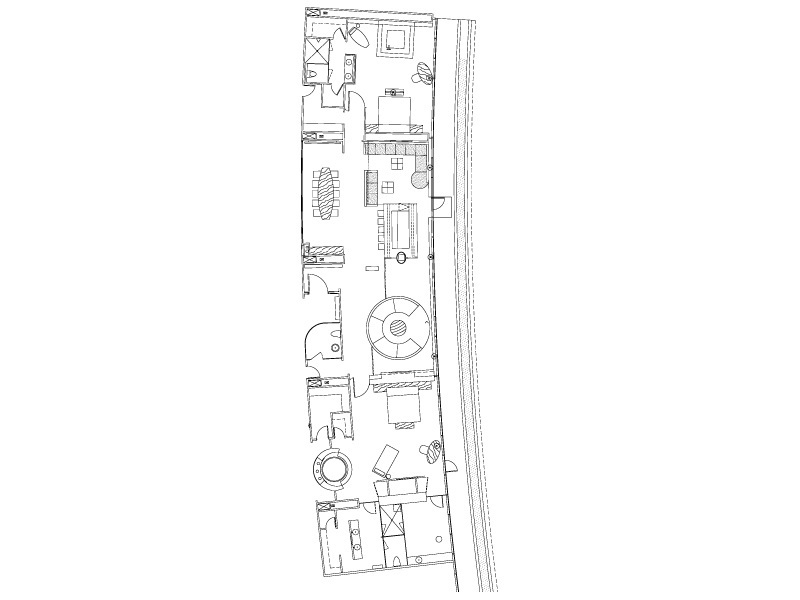 When you enter the parlor you’ll find two expansive living areas. The first features a large, round rotating sofa, CD/DVD player with upgraded surround sound and a 52-inch high-definition plasma TV. The second living area also has a large sectional sofa, plus at 42-inch HDTV with upgraded surround sound. Luxury amenities include a dining table for eight, a private powder room and a large bar featuring five bar stools as well as additional seating for at least 10 guests. This über luxurious suite also offers a full Creston Audio, Visual and Lighting Control System, voiceover IP Internet phone, iPod docking stations and motorized drapes. And for the ultimate in luxury, the Canyon Suite comes equipped with a personal butler service paging system and private service pantry with a separate entrance for service staff. Two-bedroom suites in Las Vegas don’t get any more luxurious than this, as the Canyon Suite provides its very own fireplace and Jacuzzi® tub. Also provided are exceptionally comfortable beds, boasting premium down duvets and pillows, along with 320-thread-count Egyptian cotton linens. And there’s no shortage of entertainment options here either, as each bedroom features its own 42-inch high-definition plasma TV with DVD player, high-speed data jacks, Bose® radios, in-room safes, full-length mirrors, and motorized drapes. Looking for Las Vegas Jacuzzi suites at a hotel off the Strip? It doesn’t get any better than this. 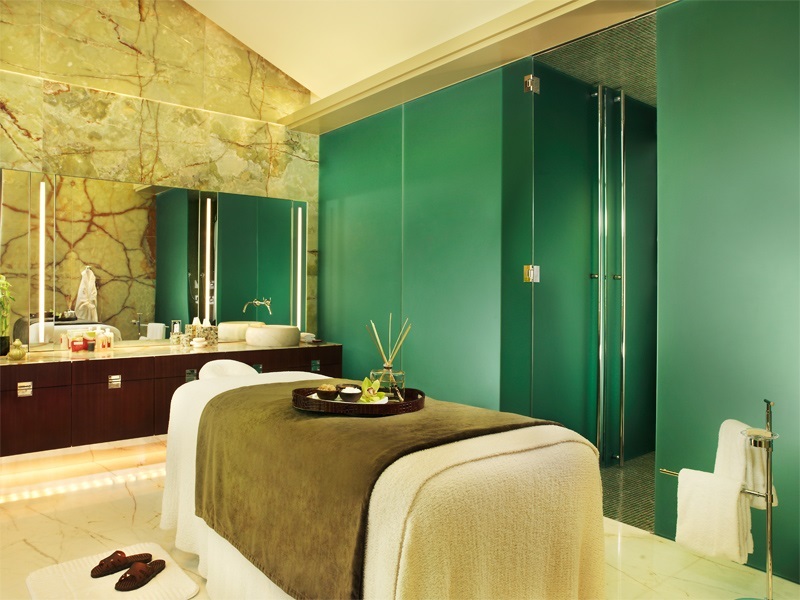 The Canyon Suite offers the ultimate experience for those desiring tranquility, relaxation and rejuvenation in their own private spa. Full marble bathrooms include a separate personal massage room, large Jacuzzi®-style tubs, steam showers, dual sinks, 17-inch LCD TVs in the water closets, plush slippers and robes, and Toto® Washlet® toilets/bidets.